An imposter assumes the identity of Martin Guerre, who has been away for a decade, and assumes his life. After his family and other villagers suspect this Martin to be “Pansette” from the neighboring village, they bring him to court to reveal his real identity. No matter how many shots of knights and kings gallivanting off to fight in battle and clerics contemplating God in their cloistered abbeys, the peasantry is always pushed to the fringes of the scene. 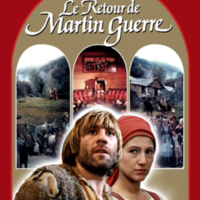 French director Daniel Vigne, however, brings the lives of sixteenth-century peasants and merchants to the foreground with La Retour de Martin Guerre (The Return of Martin Guerre), released in 1982. Martin Guerre is not a romantic tale, but tells a case of identity fraud where a man, Arnauld du Tihl (Gérard Depardieu), successfully lived the life of a Martin Guerre (Bernard-Pierre Donnadeu) after the latter had abandoned his wife and land for more than a decade. He managed to “fool” Martin’s wife, Bertrande (Nathalie Bayes), and the entire village for so long that once enough doubt over his true identity was sown, it still required two trials and an appeal to the highest court in France’s Languedoc area, the Parlement de Toulouse, to find out the truth about the matter.Arnaud was about to win his case if it were not for the miraculous arrival of the real Martin Guerre. Daniel Vigne’s “microhistorical” film stands in stark contrast to other medieval movies: notions of chivalry or unrequited love are not explored, and a rural civil court is the closest view one gets to French royalty. Instead the director focuses on matters that concern the peasantry: marriage, magic, and the magistrate. Much of this movie takes place in a law court, but the first scene introduces the viewer to the world of medieval marriage. The elders of the well-to-do Guerre and Rols families agree to arrange one between their oldest children: Martin and Bertrande. As to be expected of two teens, they are ill-prepared for married life, and Bertrande’s mother tries to convince her to separate from Martin because of his sexual impotency. She refuses, for which historian Natalie Zemon Davis provided multiple reasons: Bertrande knew she would be forced to remarry, it allowed her to still be a part of the Guerre family without having to assume wifely and childrearing roles (for a brief time; they end up with a child, Sanxi), and she still receives credit for her virtue (NZD, 28). Even after Martin’s sudden disappearance, Bertrande makes no attempt to void the union because it would jeopardize her son’s inheritance. This is a young woman who knew how to use the law, especially as it related to family and marital status, in her favor. Still, it is important to remember that this is the sixteenth century, and Bertrande was not an early feminist trying to subvert matrimony – indeed, since the twelfth century, the doctors of the Catholic Church refused to allow wives to remarry after the disappearance of their husband, unless they had proof of his death (NZD, 33). Fortunately, she did not have to live the rest of her life in limbo between wife and widow because Arnaud arrives and immediately assumes the life of Martin. With this “invented” marriage Bertrande circumvented the restrictions of canon law: as far as the priests are concerned she has not committed adultery by sleeping with her “husband,” but she could still start a new relationship. Peasant society in the sixteenth century still held firm beliefs in the existence of magic, demons, and curses and even could produce valid evidence of such in court. During their years of childlessness, Martin and Bertrande believed a curse was preventing them from conceiving a child. The couple resort to rituals to lift the malaise: as seen in the film and described in the primary sources, an elderly lady sprinkles dust in the sign of a cross over Martin’s codpiece, commanding the flesh to be untied, then the two perform penance at a Church and attend four masses (Coras, 90). 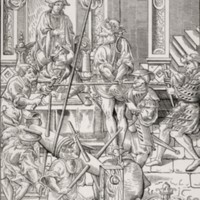 The workings of magic and curses are also evident in another scene, in which Arnaud is blamed for deception by working with the devil. A court scene involves a female witness who attests to feeling set ablaze when Arnaud entered the village and laid eyes on her, and the judges seriously consider whether or not the defendant might be a demon. Coras mentions in his Arrest Memorable that the court suspected him of using magic to gain knowledge of so many villagers, until his confessions reveal he received information from other people (Coras 97). Marriage and magic are recurring themes in medieval movies, but Vigne put his spotlight on a rarely explored topic - legal practice in sixteenth-century France. Within the first six minutes, the overseeing judge, Jean de Coras (played by Roger Planchon), arrives in Artigat to interview Bertrande. Peasants could avail themselves of judicial remedies, such as the ability to bring lawsuits to courts, to accomplish their goals. Due to the lack of fingerprinting and other identification, Coras’ first trial in Artigat involved him asking the villagers to stand on his left or right depending on whether or not they thought this man was Martin Guerre. While most trials of identity fraud have focused on forging contracts, this case required Coras to start another type of forensic investigation, in which he oversaw the questioning of over two-hundred witnesses in Tihl, Artigat, and as far south as the Basque (Bienen, 498). In the film, before the real Martin Guerre arrives, the silver-tongued liar perplexes the court. Rather than condemn a rightful husband and heir, Coras abides by the presumption of innocence, since all the guilty claims were either forced by Pierre Guerre or only supported by an individual witness (NZD, 81). Martin Guerre provides glimpses into the peasant world and how medieval and early modern concepts of marriage, magic, and civil courts were relevant to their society. A fantastically unique film about peasant life and identity theft lets the modern viewer into the world of sixteenth-century court proceedings. While the setting is certainly unfamiliar to modern day viewers, the deliberation between defendant, witnesses, and judges – in addition to its emphasis on how justice operated within the unfamiliar world of the Basque-French peasantry – may echo modern day courtroom scenes. Bienen, Leigh Buchanan. "The Law as Storyteller." Harvard Law Review 98, no. 2 (1984): 494-502. https://doi:10.2307/1340847. Davis, Natalie Zemon. The Return of Martin Guerre. Massachusetts: Harvard University Press, 1983. 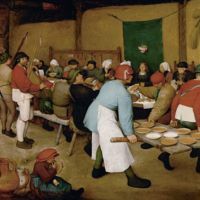 Oil on panel painted by Pieter Bruegel the Elder, titled The Peasant Wedding (c. 1567), in Kunsthistorisches Museum, Vienna.